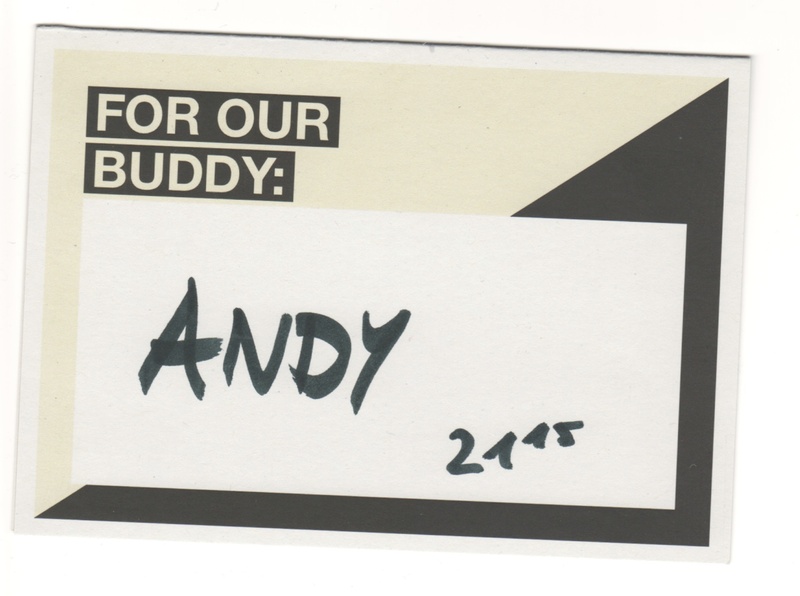 Table reservation card at 1500 Foodmakers in Vienna. On New Years Day we tried the restaurant 1500 Foodmakers located in the 25 Hours Hotel in Vienna. We reserved and found the sign in the photo waiting for us on a nice table. The restaurant is very comfortable. Tables are big and well spaced. The music is good, you can hear it but it’s not disturbingly loud. It’s possible to have a nice conversation. It’s no smoking! The staff were excellent. Very friendly and accommodating. The food was very good. Generally simple dishes, but with a hint of complexity. We had 4 pizzas and a salad. All were very good. The menu also featured some pastas and interesting dishes. There was a nice basket of “pizza bread” with olive oil and salt waiting on the table (no charge). Much of the food seems to be sourced locally or at least with quality in mind. The wine list is very nice with lots of good Austrian and international wines. We had a very nice Merlot for 25 Euro a bottle. In the summer they have a converted Airstream Trailer outside where they cook hamburgers with picnic tables. We’ll certainly be back! Last week I participated in the Velopolis 2025: How mobile are urban societies in the future? workshop at Vienna’s MAK museum. The workshop was sponsored by the MAK and Vienna’s Departure Program. It was led by Sandra Y. Richter from the MIT Media Lab. On the first day we focused on developing scenarios for the future of urban bike transport. It was a fun and interesting way to think about the future in a structured way. The other two groups focused on developing products. One developed a cool picnic basket/seat/cargo container and the other developed a concept for using compressed air to keep you dry when riding in the rain … I wish I had that for my ride today. It was a neat event both because we worked on bicycle ideas and because we learned some of the prototyping techniques used at the MIT Media Lab. Frauenkirchen Church in Frauenkirchen, Burgenland Austria, August 2013. On Saturday I took my bike on the train to Gols in Burgenland (Austria). My goal was to combine a visit to Judith Beck Vineyards with some exercise on a beautiful end of summer day. Saturday was Pannobile Day 2013 (German) in Gols. It’s organized by a group of 11 (opps!) 9 winemakers around Gols to celebrate the new year of Pannobile wine (they make a single red and/or white wine that they call Pannobile from a blend of grapes). The winemakers then work together on marketing etc. The name Pannobile comes from the Roman name for the area. On Pannobile Day all the wineries are open for tasting and there is a big dinner party in the evening. Since I was on my bike I decided it would be best to only taste one and not stay for dinner (maybe next year I’ll stay overnight and go!). I tasted three wines from Judith Beck Winery just on the outskirts of Gols. I chose her wine because I’d enjoyed it before and it’s organic. She has a beautiful winery building and tasting room. The people were quite friendly and there was nice food to nibble on. I tried a white, the Pannobile 2011 and the Pinot Noir. They were all very nice, but since I was on my bike I only took one bottle (the Pannobile naturally!). Regional train from Burgenland at Vienna Hauptbahnhof (main train station), August 2013. The bike ride was great too. Although it’s a little hard to get to the Vienna Hauptbahnhof railway station by bike (there are very few direct routes with good bike paths right now). 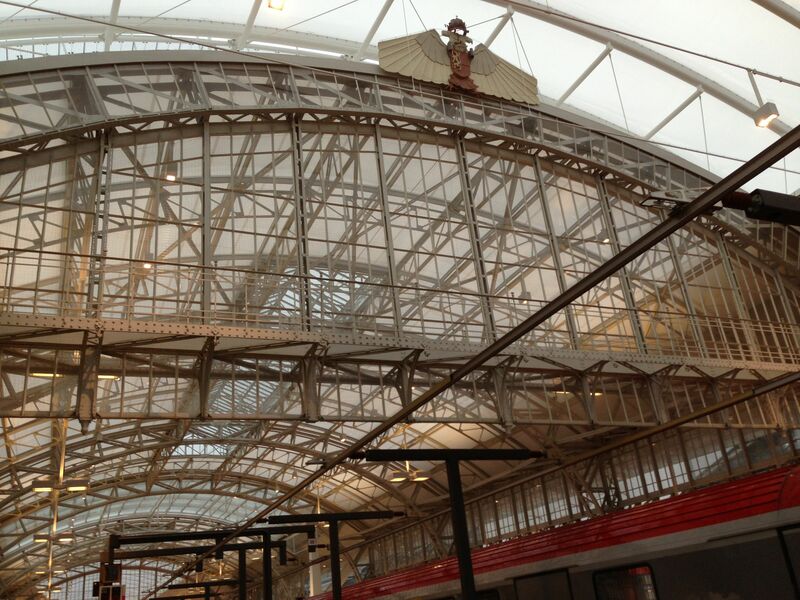 However the station is just being completed so hopefully this will change. The Austrian National Railways (OBB) has a nice feature on its travel planning software that allows you to select only trains where you can take your bike on board. You can take a bike on most of the local and regional trains. However, there was not very much space on this beautiful day for bikes, so my advice would be to get their early. You don’t need to pay extra to take a bike on these trains either, nice! I took the train to Gols. There I followed Burgenland bike route B-23 (the Culture Bikeway). It goes through the vineyards to a small city called Frauenkirchen (named after a large baroque church in the town). The church was a pilgrimage church in the middle ages and there are several historic buildings around it including what looks like an old cloister across the street. The cloister is also a historic landmark and houses a restaurant called Paprikawirt – “Paprika Restaurant” in English – that looked excellent. After a short break I headed back along the path through more vineyards and agricultural fields, then the towns of Halbturn and Mönchhof, before reaching Gols and the Judith Beck Winery tasting room. The path is quite well marked with signs and markings on the pavement, although I did get a little lost on the stretch between Halbturn and Mönchhof. After my tasting I rode around in the town of Gols since I had time before my train. There was at least one more Pannobile winery I passed and I also noticed the Pannobile Taxi, presumably to take people between wineries on Pannobile Day (another tip for next year!). The bike ride was about 24 km and the landscape was pretty much totally flat. 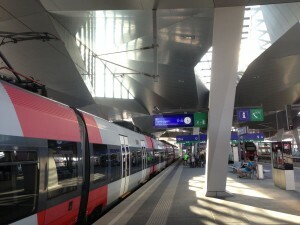 The trip to Gols from Vienna Hauptbahnhof (main railway station) takes about one hour. The OBB has a group fare called Einfach Raus that lets up to five people travel on regional trips for about 30 euros, it’s a really good deal for visitors. UPDATE: 2015 – Austria may be on the verge of changing their restaurant smoking law, but there is still huge opposition from the chamber of commerce’s restaurant group and lots of public controversy. I’ll let you know if sanity ever prevails. Something that always surprises me when I return to Austria is the large number of people who smoke. According to the European Public Health Alliance, the Eurobarometer survey shows smoking rising alarmingly in Austria – smoking prevalence has increased from 31% (2006) to 33% (2012). For comparison the US rate was 17.8% in 2013, according to the Centers for Disease Control and Prevention (CDC). Here’s an outdoor smoking area in Stockholm. It seems like a good solution: places to sit, ashtrays and heating (not visible). 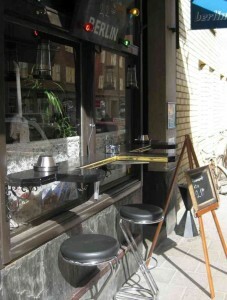 Photo of Berlin Bar in Stockholm. The European Union requires countries to regulate smoking in public places. Countries are allowed to develop their own specific laws so there’s no universal ban for smoking in public places as there is in many US states. Austria was quite late in regulating smoking and it’s been a very controversial process. The Austrian law is complicated. It allows restaurants and bars under 40 square meters to choose whether to be “Smoking” or “Non-smoking”. 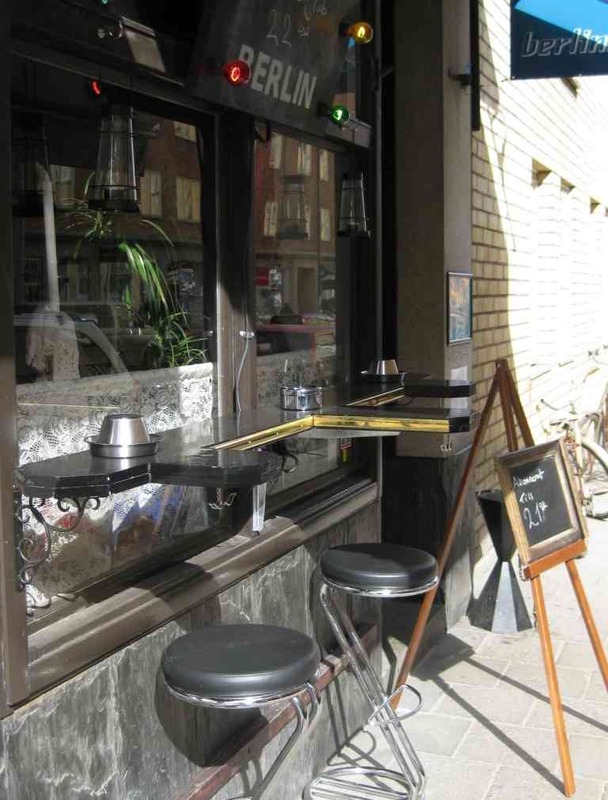 Restaurants and bars that are over 40 square meters can be all non-smoking or can create smoking and non-smoking zones (60% of the space must be non-smoking). Establishments with smoking and non-smoking zones are supposed to install walls and ventilation equipment to keep the non-smoking areas smoke-free. The law compromised on a full ban because many restaurant owners – like their counterparts throughout the world – argued that a full smoking ban would put them out of business. It’s probably true that a full ban would put some of the quite small bars out of business, but it’s also probably true that even if the government had to pay to retrain people running these bars it would likely reduce health spending in a couple years. (The number of heart attacks in the UK fell drastically within a year of their banning smoking in public.) It’s also true that tobacco in Austria is a government-sponsored monopoly, so there are some strange complicating factors. One of the main problems with the law is that, since it’s possible to have small restaurants where people can smoke, it’s very hard for restaurant owners who want to have a smoke-free restaurant. They are worried about losing the business from smokers (and, as mentioned above, a lot of Austrians smoke). This means that the larger restaurants have almost been required to spend a great deal of money building walls and adding ventilation equipment – often in historic buildings where construction is difficult and impacts the design. Furthermore, the law has not been as effective as the EU regulations require, so it may need to be made stronger in the future. Why is Austria’s smoking law important to you as a visitor to Vienna? So, I’ll always try to mention the smoking situation at restaurants I describe in my blogging. In the meantime here’s a link to da.stinkts.net … a list of non-smoking restaurants in Austria (German) even has an iPhone app (although the site seems not to have been updated since late 2010). Interestingly the normally very helpful Vienna Travel Service website does not have a list. You may think a little smoke doesn’t bother you. But, you ‘d be surprised. In places where people smoke in Austria, they tend to smoke a lot. Also, once you are used to eating in restaurants where there is no smoking, you’ll likely be shocked to smell smoke in a restaurant. One final word. Controversial. If you want to get people started arguing in Austria, it’s easy, just start talking about smoking. It’s not like America where smoking often connotes lower educational and economic status. In Austria many smokers are highly educated and upper income – that’s one of the differences you notice. Also, many people seem to buy into the tobacco company line that smoking is a personal decision that should never be regulated. My opinion? Let smokers smoke outdoors. It works all over the world even in countries where you could never have imagined it 10-years ago (think Italy). And, it hasn’t led to fewer restaurants, different restaurants, but not fewer.